Shoot for the Troops is a 501c3 (Id #82-2024344) non-profit organization, our mission is to support active military, veterans, and their families deployed or stateside who are in need of resources due to economic or special hardships. 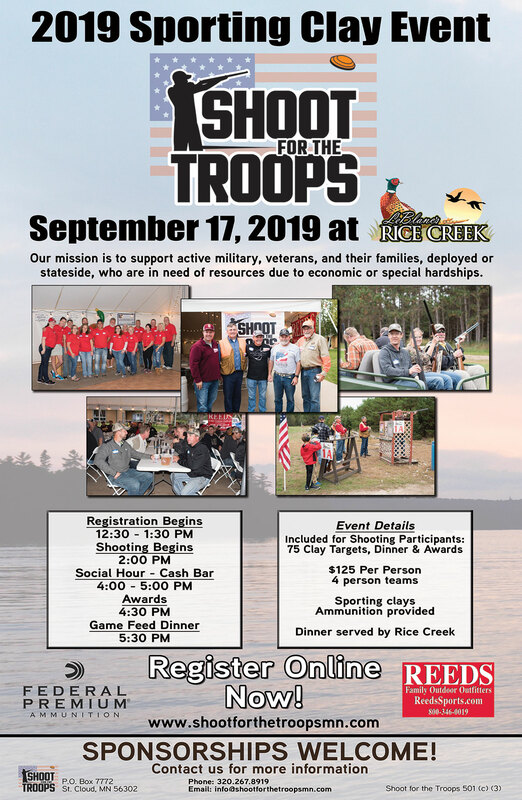 Shoot for the Troops hosts a trap shoot event annually to raise funds for military families in central Minnesota. The majority of the money raised from this Shoot for the Troops event has gone to support military families that are in need of a little extra help during times of financial hardship. Over the past 9 years, the Shoot for the Troops event has raised nearly $100,000! Contact us to learn how to get involved or your business involved with this great event in 2019!